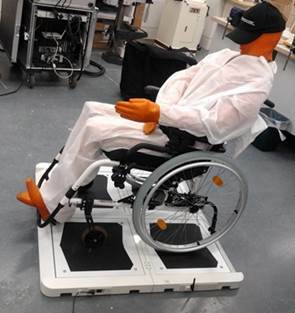 Over the last 3 years, the Health Design Technology Institute (HDTI) have been designing and developing an innovative system for assessing the stability of wheelchairs with the support of NIHR i4i funding. Poor stability can lead to a wheelchair slipping, a loss of traction, and tips and falls which can potentially lead to serious injury. In contrast, some wheelchair users want an unstable chair, for example wheelchair athletes. WheelSense aims to support wheelchair prescribers in tuning wheelchairs to the needs of the user, their characteristics, lifestyles and environment. Dr Louise Moody (CEPAD) and Jill Evans (HDTI) are currently running an evaluation study in three NHS Trusts to determine how effective WheelSense is in supporting the wheelchair prescription process. Find out more about WheelSense and other HDTI projects.